Have you ever wondered what would happen if you combined a few superpower foods together? Maybe you haven’t, but I could not help but wonder what would happen if I did just that. 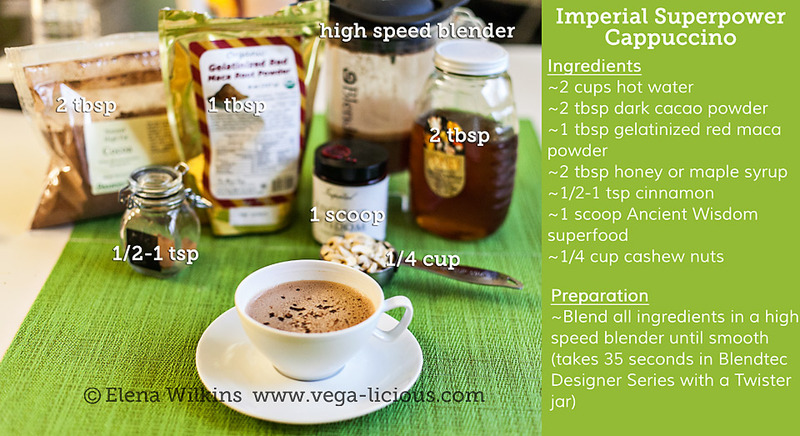 So, I whipped up one of the most energy loaded drinks–a superfood cappuccino. When I am created this drink and I loved its taste and creaminess, I gave it to Hubby to taste. “How is it?” I asked after the first couple of sips. When he was done with his cappuccino, he wanted more, and said he would love to have one every day. Since I whipped it up late in the evening, I cautioned him to be content with just one serving, or risk being up all night. 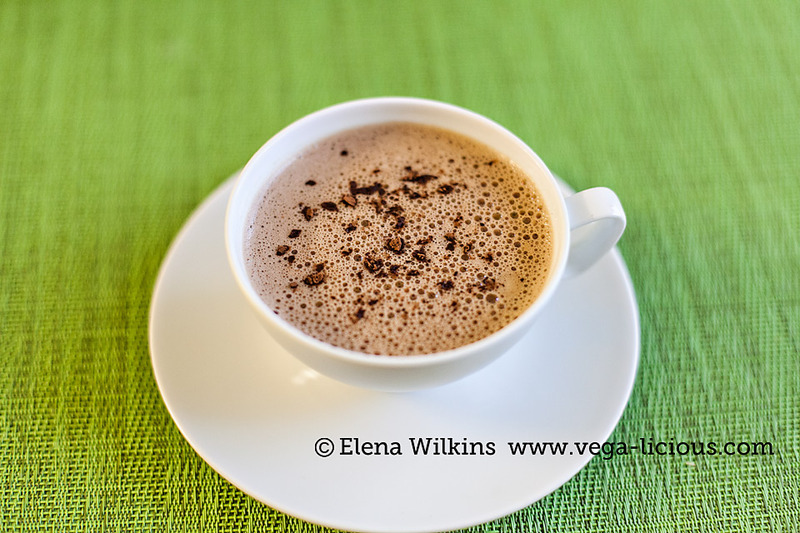 You do not need a cappuccino maker to whip up this delicious drink! This cappuccino is made without coffee, but it will keep you buzzing nevertheless. Do not drink it late at night–you might not get a wink of sleep! It should be enjoyed as a treat, since cacao is still a stimulant. I specify which brands of superfoods and equipment I used to make this recipe a success, in the recipe. Feel free to substitute them with other brands, if you already have them on hand. I will describe benefits of each superfood under the recipe, so it will make sense why I chose to combine them. If you would love to pin this recipe to your favorite drinks Pinterest board, you will see a pin-able image at the bottom of this post. High speed blender. I used Blendtec Designer Series with a Twister jar (it was perfect for the volume of this recipe) . Place all ingredients into a high speed blender and blend until smooth. Using Blendtec Designer Series with a Twister jar it took me only 35 seconds to make Imperial Superpower Cappuccino. I have been using The Maca Team’s maca for the last few weeks and love how noninvasive its smell and taste are. It was not even detectable in this cappuccino. You can see why I picked The Maca Team maca products in a recent review post. Make this easy cappuccino recipe, take a picture and add it in the comment section under this post. Let me know what you think of it. Remember to share it with other cappuccino and chocolate lovers! Use social share buttons around this post.